Standard - $147.99 Only 1 left! Gobble Gobble! Bird’s the word! Have you ever seen a turkey out in the wild? We’re not gonna mince words -those are some unattractive birds! U-G-L-Y, those things have got no alibi! They’re also really stupid, for the record. For instance, imagine a chicken with it’s head cut off, and that’s basically what a turkey is like with it’s head still attached! But we still love ‘em, because boy, that meat sure is delicious! And there’s nothing like seeing a turkey - real or otherwise - to get us excited for what is, hands down, one of our favorite holidays - Thanksgiving! Is there anything better than sitting around with our families - or friends, in case your family is a real drag - and celebrating all the things you’re grateful for - like say, the joy of being made a human and not an ugly, stupid wild turkey - by stuffing your mouth full of turkey, mashed potatoes, and pumpkin pie?! Nope! 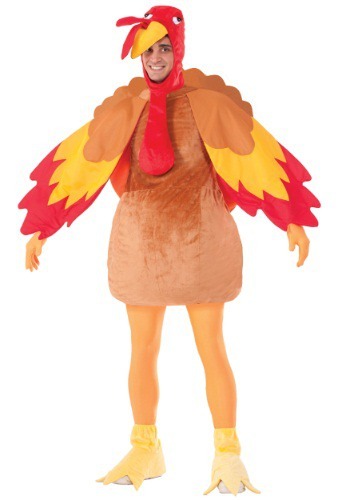 So if you’re as excited to get into the Thanksgiving spirit as we are, then this Adult Deluxe Turkey Costume is the perfect costume for you! Made of 100% polyester, this turkey costume features a headpiece with a Velcro enclosure on the back, foot covers that also have elastic bands and Velcro enclosures on the back, and a tail with elastic bands that go over shoulders and hold the tail upward! The costume also sports wings that also have elastic bands (elastic bands ev’rywhere!) that go over the wrists. Add some gloves and tights for those turkey legs, and boom - put a fork in it, because you’re done!